Practice golf balls make a great gift idea for the golfer so he or she can get some easy practice time around home, and the featured P3 Almost Golf Practice Ball is a great option. The Point3 golf practice ball has a limited distance flight of 100 yards max (40 yards with wedge) but responds like the real thing. It is "off course safe" and lightweight at just 13.5 grams - 1/4 of a traditional golf ball. With the ball tube, you can retrieve your practice balls without bending over, and then easily release them by hand or foot. This item comes with twenty four practice balls so golfers can turn their backyards into a true driving range experience for real results out on the course. 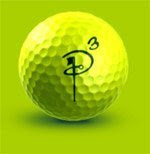 P3 Almost Golf Practice Ball 24 Ball Tube - Yellow @ Amazon.com .